Our yoga package can be combined as an “add-on” with any of our other packages. Our yoga classes will help you to improve your balance, strength, flexibility, and to connect with the present trough your breath and mind. It will also help you surf longer and better! Five 1,5hrs yoga classes per week with a certified yoga instructor. Tailor-made setup for your level. All necessary equipment (mats, blocks etc). 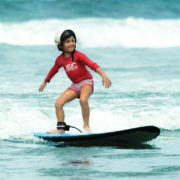 Our progressive surfing lessons are for everyone. The beginner program, developed by Ripcurl, will teach you how to paddle into waves, stand up, and finally glide across the wave. Our goal is to have you catch your first wave and stand up on the first day. In a week the Beginner Package aims to give you all the skill and knowledge necessary to start your life as a surfer. And don’t worry, you will have a blast while you are learning! Below you will find our 4 different courses with RipCurl. Level 1 and Level 2 course are for novice surfers and the Level 3 course is for intermediate surfers who wants to take their surfing to another level. The level 3 course and our “little ripper program” is on request and the pricing is slightly different. If you are interested in the Level 3 course or the little ripper program, just let us know and we will tell you more! If you have never surfed before or are still a beginner this course will set you up with some essential knowledge. You’ll learn the art of riding ocean waves with the fundamentals to take your surfing to the next level. The course focuses on basic surfing technique, paddling, popping-up, wave riding stance, turning your board on the wave, ocean knowledge and safety. After taking this course you’ll be surfing beach break waves, feeling comfortable in the ocean and know the correct surfing etiquette. m turns, carving and cutbacks. See for yourself when and where you are going wrong with video analysis of your session, and by the end of this course you’ll know exactly how to keep improving your technique. You’re already pushing the limits of your surfing and are now ready to throw yourself in the deep end. This course is designed to help you to step up your game. Learn how to drive off your bottom turn to slash the lip of a wave, master fast rail-to-rail surfing and smoothly link your manoeuvres. Borrowing elements of the Rip Curl Team Rider Manual, this specialised course will make sure you can really nail those manoeuvres and tricks that you’ve been working on. Not sure which course is the right one for you? To us, surfing in Bali is one of the most enjoyable things in life, and the fact that it is actually a great exercise is just one of the benefits of surfing. You don’t have to do any preparation before you come and visit us in Bali, but if you you are really stoked and can’t wait to get started, there is a few simple things to do to help get the most out of your stay with us. You can have a lot of fun just surfing close to shore and playing around in the waist deep water, but once you start surfing a bit further out, a good swimmer will have a head start. Get down to your local swimming pool a couple of times a week to get your freestyle swimming going, the payoff will be huge. It can be difficult to get started but hang in there and you will go from being able to go one length to 15-20 lengths in a month or so. To improve your technique we recommend watching a few youtube videos, our personal favorite is Alexander Popov who shows how important the rhythm and control is when swimming. Flexibility can often be limiting to a lot of people as you need to be pretty flexible to get the most from your surfing. Yoga is a great way to improve your flexibility while also strengthening your core muscles, which will improve your balance greatly. So give it a try, and if you don’t have the prssibility to attend a class, give youtube a try! Once you’re here with us you also have the option to book a few lessons with our yoga teacher at the camp to make sure you’re doing it right and help you get a routine that will help for your next surf trip! Check out our additional yoga package. It is also a good idea to get your strength up, especially in those paddle muscles, legs, and torso. If you need some inspiration for your next gym session we have compiled a Pinterest board with some of our favorite exercises and training tips. Do you have any set days for the surf courses? No, We at Surflodge Limasan aim for flexibility, therefore you can arrive any date or any day as long we have a room or a bed for you available at the lodge. Our courses start every day – all year round! Is it ok to join Surflodge Limasan if I am traveling alone in Bali? We think that, as a single taveller, the best choice is to join a surf & yoga retreat as Surflodge Limasan as you will meet new friends with the same interests. Our shared rooms are the perfect choice when traveling alone. We assure you that you will leave with new friends and memories! I don’t drive a scooter, how do I get around? Balis traffic can be pretty overwhelming and we totally understand if you don’t feel ready or safe driving your own scooter. We provide pickup and dropoff when you are attending a surf course and if you want to go somewhere else sometimes, there are cheap taxi services (such as Uber). If you just want to check out the neighborhood, we have a bicycle at the lodge which you are free to use. We also have our own mini-bus which we use when we go for roadtrips and excursions. Do I need any vaccinations when traveling to Bali? We recommend you to talk to your local vaccination clinic before you travel to Bali or any other countries around in Southeast Asia as they are up to date with the latest information. Do I need a visa to enter Indonesia? Yes, all travelers from other countries need a Visa. There are several different visa types, depending on how long you are planning to stay and from which country you are from. We recommend you to contact the Indonesian Embassy before and apply for the visa best suited for you. Yes, we have a good vegan and vegetarian menu at Surflodge Limasan. Just let us know when you contact us and we will let our chefs know. Why are you not located directly on the beach? In Bali, and especially in tourist areas such as south Bali where Surflodge Limasan is located, there are many regulations regarding buildings directly on the beach which makes it almost impossible to have a small retreat as ours. We choose an area where we are close to everything instead, for example when we, during the wet season, go surfing on the east coast mostly. Our area is very strategic in that point of view and we appreciate being close to the local community instead if the dense tourist areas. Are all meals included in the price? 15% downpayment is required to allocate a room/package. Full payment is required within 1 week, unless departure is more than 30 days in advance in which case 50% deposit is required to make a reservation. Deposits are non-refundable but may be used towards a future trip subject to 30 days written notice requesting variation of dates. Final Payment is due 14 days prior to departure and is non-refundable but may be used towards a future trip, subject to 30 days written notice requesting variation of dates . (Must be used within one year from date of receipt). A 4% fee for credit card or PayPal payments. Credit cards are not accepted at surf camp. Passports must be valid for at least 6 months from the date of departure. If applicable, a valid visa is required for travel & we suggest ALL guests traveling to Indonesia confirm current visa requirements before departure. To drive in Bali you need an IDP (International driving permit). Apply for IDP in your country before you arrive if you plan to drive a car or motorbike. Travel Insurance is mandatory for your safety. Surf guiding means we will take you to the surf spot i.e. transport you to the best surf spot in the locality depending on your ability and preference. We will also provide information regarding tides, winds, rips and access to/from the break. Surf guiding is only suitable for experienced surfers and does not include any supervision services of surfers – if you book our “Surfer package”, you will be expected to be able to surf independently. If you require assistance with surfing, and/or supervision in the water, then it is mandatory to book surf lessons for reasons of safety and your enjoyment. 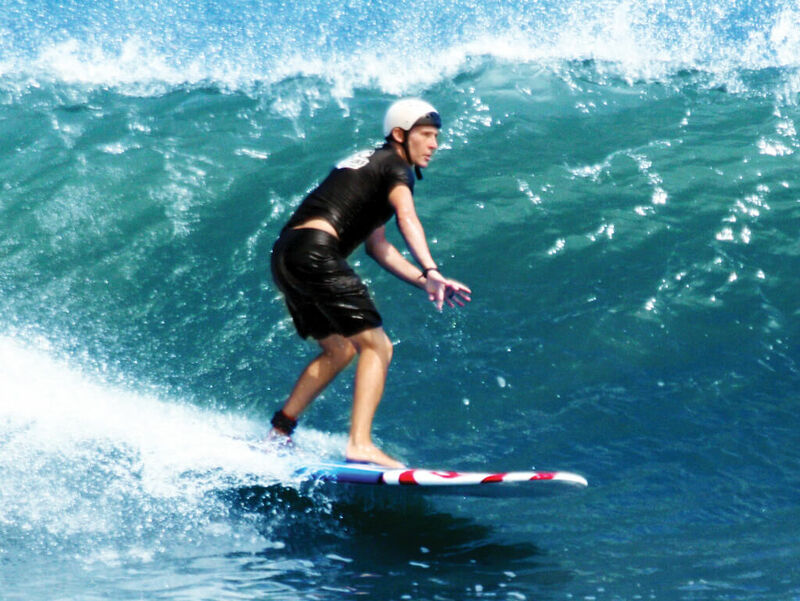 We at SurfLodge Limasan aim to provide an unpretentious, convenient, yet luxurious surf camp in Bali. We and our guest simply enjoy to live comfortably, indulge in good food, and having fun while surfing the excellent waves Bali has to offer.